Vic Law drives on a defender. NEW YORK — Vic Law looked out of place on the bench at Madison Square Garden on Thursday. His khaki pants nearly blended in to the boot on his right foot and his purple polo looked not quite big enough for his lanky frame. During the game against Penn State, he seemed uncharacteristically passive, only occasionally gesturing to sophomore bench-mate Isiah Brown with comments. After Northwestern’s season-ending loss, he plodded down the handshake line at its rear, just ahead of the equipment staff. But perhaps he looked out of place simply because he was on the bench at all. Despite missing two different stretches this season with injuries, the junior forward was the most improved player on an otherwise surprisingly bad Wildcats team, serving as their best defender as well as an unheralded offensive weapon. And with senior guards Bryant McIntosh and Scottie Lindsey — the undisputed faces of NU the past two years — having now played their final collegiate games, this is now Law’s team. That will be strange, and not just because it will be different. Unlike McIntosh, a point guard who dribbled the ball far more than anyone else, or Lindsey, a trigger-happy shooter who attempted 97 more field goals than anyone else, Law is not a flashy or easily noticeable player. He’s a soft-spoken interviewee and, as formerly the top recruit in school history, doesn’t have the underdog narrative that McIntosh did. But make no mistake about it, Law may have been the Cats’ most versatile weapon this season, and he almost certainly will be next winter. Defensively, he shut down nearly every scorer he matched up against, from Creighton’s Marcus Foster to Purdue’s Dakota Mathias. 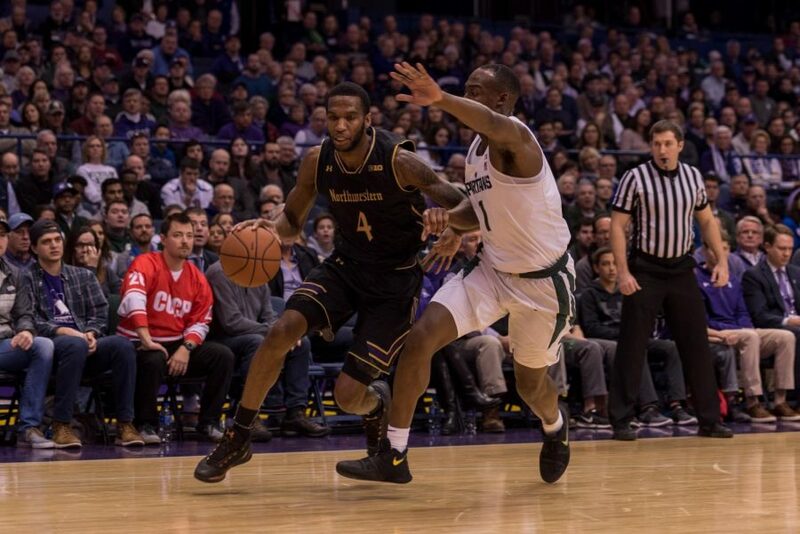 Later in the season, he held Chris Collins’ hybrid zone together for a while, and only when he went down with an ankle injury did the system’s effectiveness truly fall apart. The forward has the length to cover big men towering above his 6-foot-7 body and the athleticism to keep up quick ball-handlers, too. Offensively, Law eliminated the inefficient long 2-pointers he was prone to taking in 2016-17 and became both a better shooter and passer in addition. In conference play, he took 1.5 fewer 2-pointers but 1.2 more 3-pointers per 40 minutes than last year, and improved his 2-point shooting by six percentage points while maintaining the same 3-point shooting percentage. He also nearly doubled his assist rate and slightly improved his rebounding rate. Law will be tasked with handling an even bigger role in 2018-19, especially since the rest of NU’s squad, except for senior-to-be center Dererk Pardon, will be so inexperienced. And dealing with their collective inexperience should be part of Law’s role, as well: he’s already the primary mentor for defensive-minded freshman guard Anthony Gaines — a likely candidate to start next season — and will also need to take incoming four-star recruits Pete Nance, Miller Kopp and Jordan Lathon under his wing. That’s a lot of weight on Law’s shoulders, but it’s weight Collins will need him to carry expertly if the Cats are to rebound from this winter’s disappointments next season. If he can handle all of it, Law will have a chance, given his well-roundedness in the college game and the athletic intangibles to translate it to the next level, to be NU’s first NBA draft pick since 1999.